It is some time since David Moyes’s name could be associated with forward momentum and the same could be said of West Ham United, too. This felt like the first major step in an unlikely rehabilitation for both: if the recruitment of Moyes last month felt repulsive to supporters of a sepia-tinted persuasion then surely even the most begrudging of souls would acknowledge the improvements he has wrought in only a month. Chelsea were deservedly beaten by opponents who were simply more organised, more determined, more athletic and who found a sting when on top. Nobody in West Ham’s current position can ask for much more and their first league win since September was achieved with an added touch of old-fashioned style. The flourish in question was provided by Marko Arnautovic, whose very selection came to feel like a piece of sound management from Moyes. West Ham had set a template for their relegation battle in digging deep for a narrow defeat at Manchester City last weekend. Arnautovic had been consigned to the bench for that one and it seemed a clear message that the £20m signing from Stoke needed to up his game. Greater forward thrust was always going to be needed for a home fixture and Moyes recalled him here, the manager seeing himself rewarded by 69 minutes of unstinting energy and the kind of outstanding strike such a fee demands. If Antonio Conte chooses to be critical – and that is not really a question – then he might look at how easily Arnautovic rolled Andreas Christensen after receiving possession from Michail Antonio, as well as the smooth passage he was then granted into the penalty area. 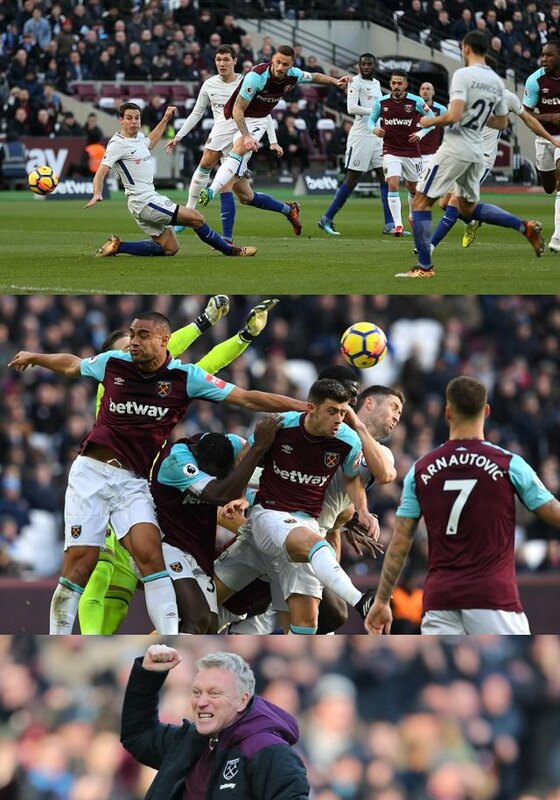 But the Austrian’s sixth-minute give-and-go with Manuel Lanzini was the action of two players perfectly in tune; the finish, curled left-footed into the far corner, was his first goal for the club and West Ham had reward for a fast start that caught Chelsea flat-footed. Conte had spoken beforehand of the “sacred fire” required of players in the very top bracket. Few have ever detected that in Arnautovic but he set the required tone here and West Ham followed, throwing themselves into every duel and barely losing a challenge in the opening 20 minutes. In the meantime they began to enjoy themselves; the sight of Arthur Masuaku bamboozling Davide Zappacosta with a slick pirouette on the ball may have prompted double-takes but was entirely reflective of the devilment with which they emerged. Arnautovic later had Christensen on toast again near the right corner flag but, after wriggling free, allowed the centre-back to recover. In the second half he had a reasonable claim for handball, and a possible penalty, against the same player turned down by Anthony Taylor but by that point any attacking situations West Ham created were essentially crumbs. Moyes thought his players could have done better on the counter as Chelsea pressed but the diligence with which they held their lead excused any inattention further forward. There were spells, particularly midway through the first half and at the start of the second, when the pattern threatened to degenerate into the same kind of siege that eventually broke them at the Etihad. In the event, it never quite turned out that way and West Ham rarely found themselves struggling for oxygen even when under intense pressure. When they did flounder, Adrián saved in quick succession from N’Golo Kanté and Zappacosta, keeping them ahead at the break and justifying his selection ahead of Joe Hart. In fact Adrián was hardly extended in the second 45 minutes, Winston Reid marshalling an impeccably drilled back line that was rarely turned around and spent much of its time repelling speculative deliveries from out wide. How disappointing this was for Chelsea and Conte, who suggested afterwards that a title race is barely worth discussing. His concern is now the five-into-three equation that all the Champions League contenders bar Manchester City must trouble themselves with; his mood might have brightened if Álvaro Morata, played onside by Masuaku after Kanté produced a rare moment of ingenuity, had not blasted their best chance wide six minutes from time but a draw would have papered over the cracks. Morata, who had been a late fitness doubt for this game, did not look sharp and Conte would presumably love to lighten the load on a player who is shouldering a heavy burden with no alternative of comparable quality. “I can give my opinion but the last decision is of the club,” Conte said of any January arrivals. Greater attacking variation would do little harm, the half-time introduction of Pedro for Tiémoué Bakayoko doing nothing to add subtlety. For Moyes, whose after-match grin perhaps betrayed the circumspection of his words, it was a return to the top. Almost three years have passed since he led Real Sociedad to a similarly stirring 1-0 win over Barcelona; there have not been many highs since then but now the big names keep on coming. “I came off there, took my jacket off and then thought: ‘No, I’ve got Arsenal in midweek’,” he said. That test will take place on Wednesday. More where this came from and the impression will solidify that, for West Ham, he is the right man at exactly the right time.